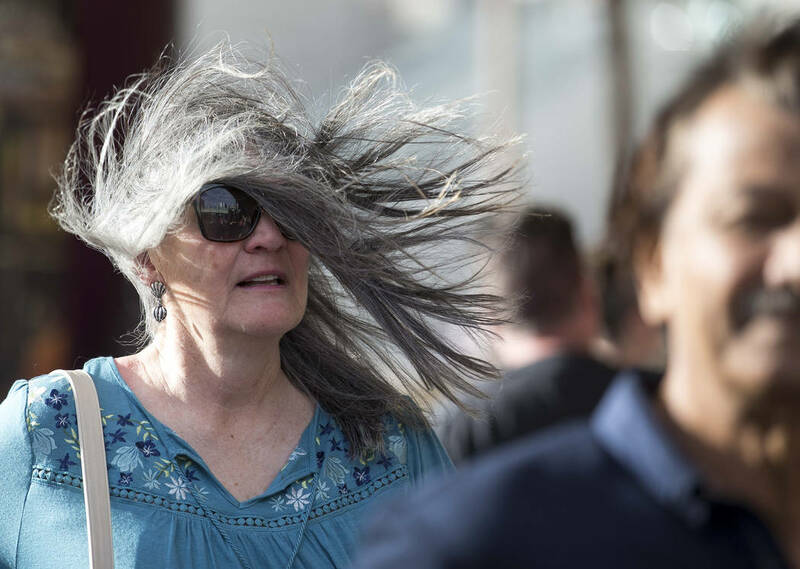 High winds will fire up Sunday afternoon in the Las Vegas Valley and continue until Monday night, the National Weather Service said. 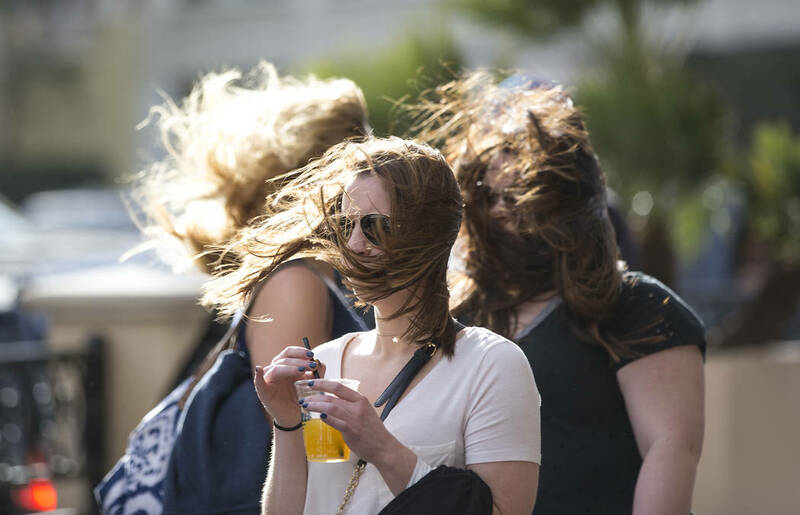 High winds whipped through the Las Vegas Valley on Sunday and are expected to lead to a significant drop in temperatures that will last until midweek, the National Weather Service said. 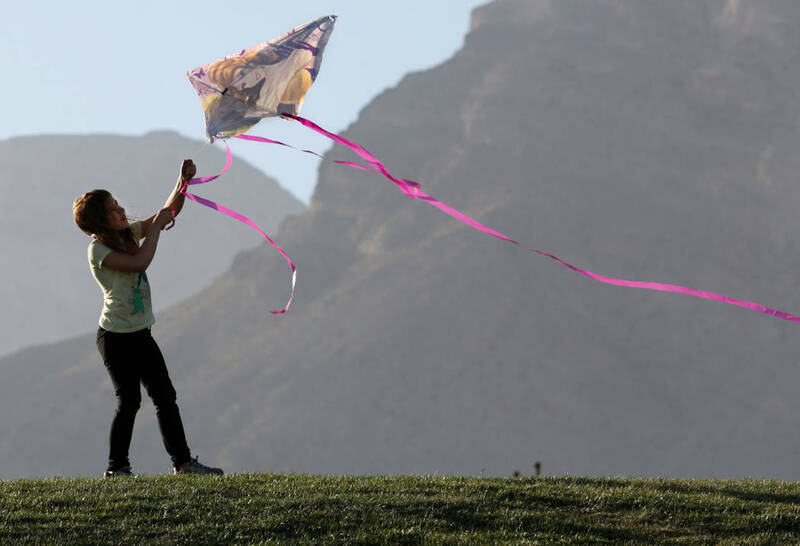 The worst of Sunday’s gusts are expected to hit the valley between 9 p.m. and midnight, the weather service said. Areas along the western and southwestern edges of the valley are expected to see gusts of about 60 mph. Widespread winds exceeding 50 mph are expected in the rest of the valley, with the exception being the northeastern part of the area. 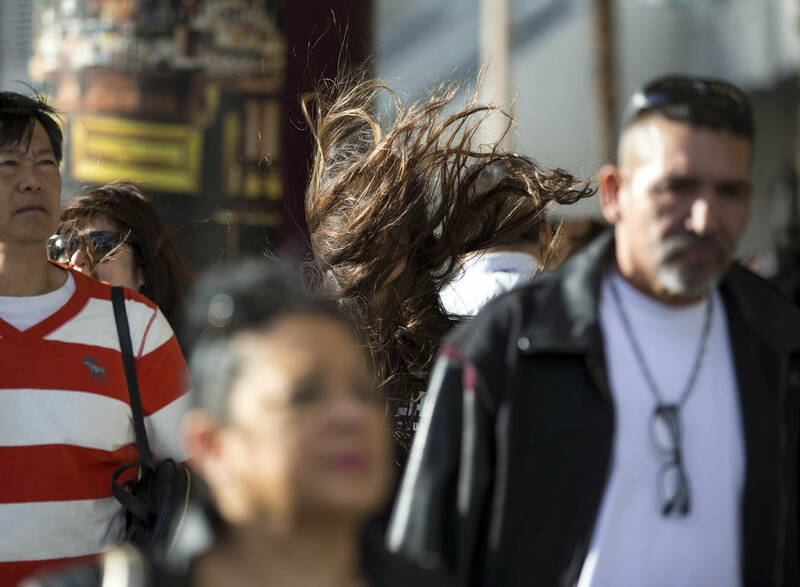 Winds are expected to taper off after 3 a.m., the weather service said. 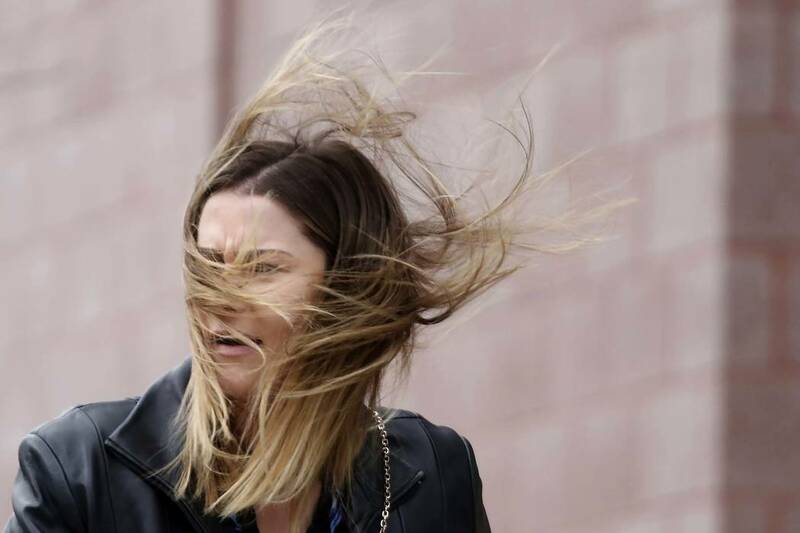 A wind warning is in effect until 4 a.m.
By early Sunday evening, several minor power outages were reported in the valley, affecting only a handful of people. Cold air will be moving in Sunday night, leaving Monday with a forecast high of 50 degrees, a low of 42 and winds that could gust up to 35 mph, according to the weather service. 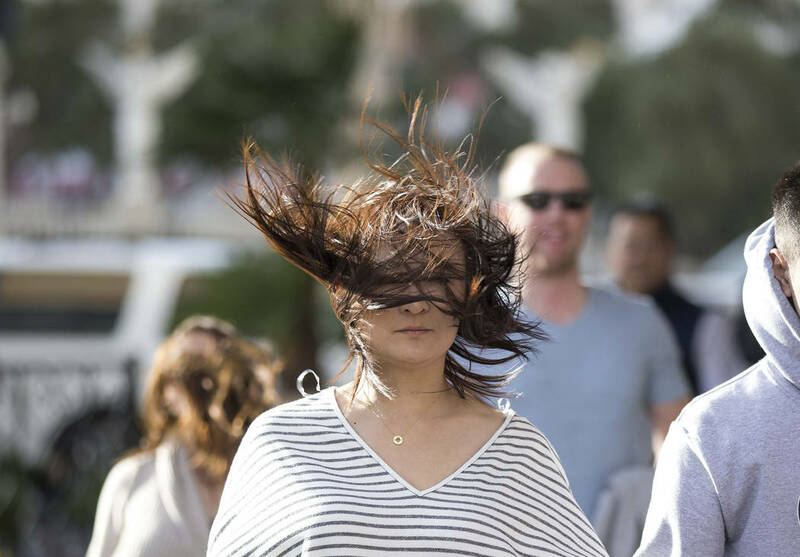 The valley could see sustained winds of 15 to 25 mph, which are expected to calm down by Monday evening. Tuesday has a forecast low of 32 and a high of 48, the weather service said. If Tuesday’s high stays at 48, it will mark the first time the high was below 50 degrees since Jan. 7, 2017. Chilly weather will continue Wednesday with a forecast low of 30 and a high of 51. The valley will warm up slightly starting Thursday, with an expected low of 34 and a high of 56. Friday is expected to bring a low of 41 and high of 57. Saturday shows a forecast high of 59 with a low of 38. 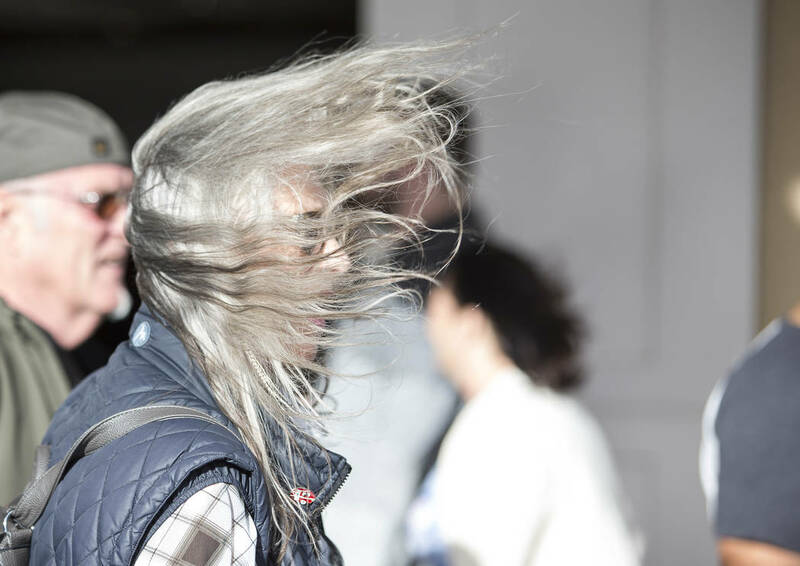 The looming forecast left some businesses to prepare for strong winds and a temperature plunge. As of 4 p.m., the Stratosphere had closed one of their three rides, the Big Shot. The other two, the X-Scream and Insanity, remained open. 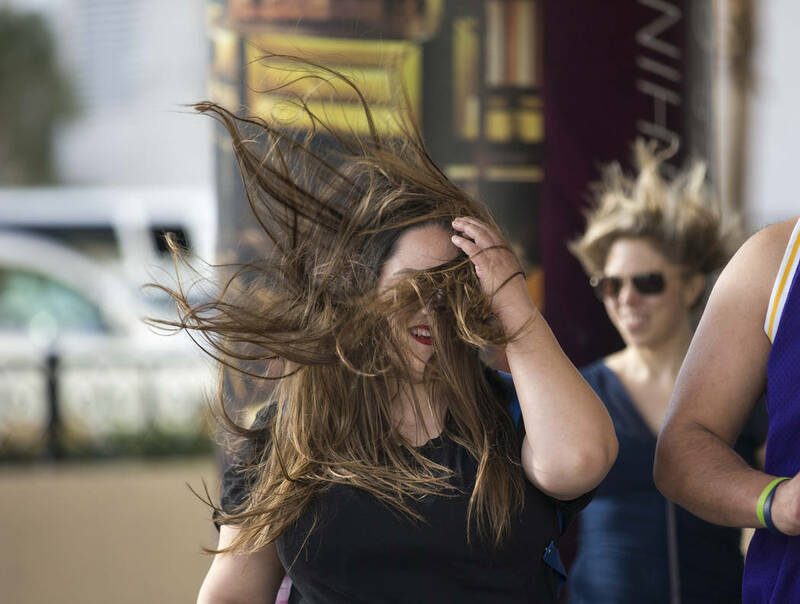 The expected winds were not enough to close the SlotZilla zip line that sends riders flying over Fremont Street in downtown Las Vegas. A representative from the Fremont Street Experience said the attraction is expected to be open through the night. 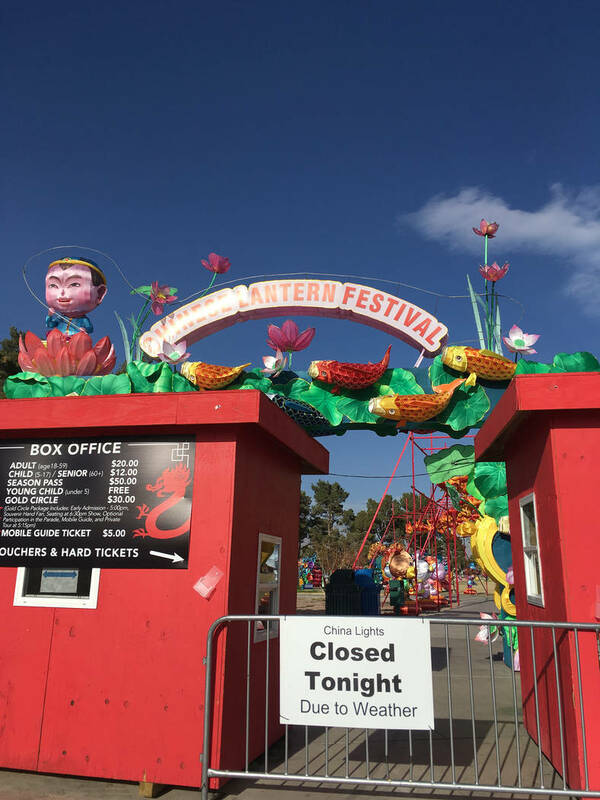 China Lights, the international lantern festival at Craig Ranch Regional Park in North Las Vegas, was canceled Sunday because of weather. “The lanterns will be fine, but when it’s too windy, we can’t do the performances, and it won’t be enjoyable for the people watching,” event manager Huiyuan Liu said. At The Las Vegas Farm off Grand Teton Drive, owner Sharon Lisenbardt was getting ready for a night of preparation. The 5-acre farm is home to hundreds of animals, and damage from high winds sometimes take weeks to clean up. But most of all, the animals need protection, she said. All gates and doors are chained and locked. Heating pads are put out for the rabbits and cats. Light bulbs will be strapped to all the small animals to generate some heat. Metal stakes will be attached to bee hives to keep them from toppling over. This week’s forecast cold snap will not stay long enough to cause any significant damage to plants, said Gigi Umpierre, a saleswoman for Moon Valley Nurseries in the northwest valley. Umpierre suggests people wrap their citrus trees and queen palms in burlap to protect them from the cold. ”A couple nights should not be a problem,” she said. In strong winds, young canopy trees need to be staked in the ground, she said. The nursery is not taking any special precautions for Sunday night’s expected winds. “If something falls over, we’ll just pick it up tomorrow,” Umpierre said. Contact Briana Erickson at berickson@reviewjournal.com or 702-387-5244. Follow @brianarerick on Twitter. Contact Blake Apgar at bapgar@reviewjournal.com or 702-387-5298. Follow @blakeapgar on Twitter. 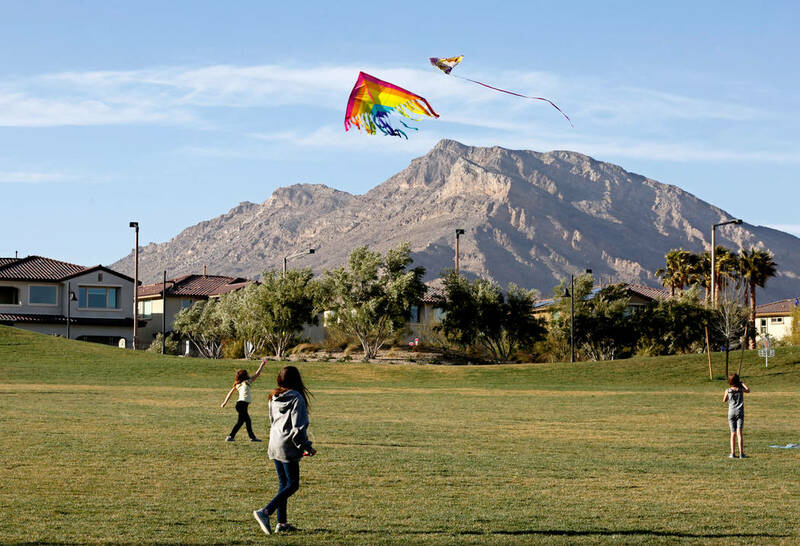 Skies in the valley are expected to be clear for most of the week. Monday will be partly cloudy, the National Weather Service said, but the sun will come back out Tuesday through Thursday. Some cloud cover is expected Friday, but the weekend should be clear, according to the weather service.